A Relaxing, Indoor Tabletop Water Feature. 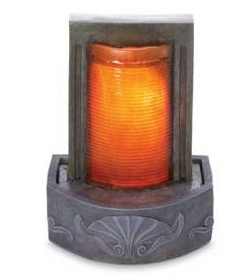 This gorgeous amber glass glowing fountain is sure to charm. The water flows over the face of this stone-finished fountain. This Zen table fountain will add to your already relaxing zen like environment. Relax to the soft sounds of trickling water. It will soothe your mind, body and spirit, leaving you calm and rejuvenated. This magnificent indoor fountain, with its beautifully detailed design, is constructed from strong, yet lightweight materials and finished off with a natural weathered stone look. Achieve the look of class and enhance the decor of your home or office. This 10.25-inch high fountain will look great on any table, shelf, desk or dresser. Use it to enhance and calm any indoor space. It includes the pump and everything else you need. A long lead and standard three-prong cord allow you to plug this fountain in anywhere. Lightweight, yet sturdy fiberglass constructions gives this fountain the look of natural stone without the cost or weight. Because this item is made to order and hand-finished, color may vary slightly. Order Yours Today! Dimensions (L x W x H) 7.5" x 5.5" x 10.25"
The Amber Zen fountain - Perfect for any indoor space. This uniquely styled fountain will enhance the decor of any home or office. Lightweight materials and a small footprint make it easy to place it almost anywhere. Order Yours Today!